Western snowy plovers stay out of the wind and weather by hunkering down behind beach debris. A western snowy plover prepared to chow down on a tasty snack that it is extracting from the sand. The bald eagle landed on the beach and began to dance around. The entertainment lasted quite a few minutes. After the dance, on the look out for more lunch! It looked as though the eagle had just finished eating some carrion from further down the beach. During the annual Christmas Bird count in December 2018, my friend Susan and I were lucky enough to be able to drive the beach and count the different species as well as the number of individual birds of each species that we saw. It was the day in between storms and high tides. It was perfect for documenting the number of shorebirds, raptors and other species that were flying in the area or feeding and resting on the beach. Most were feeding because they had been hunkered down the day before, waiting out a raging storm. In total we tallied 15 identifiable species including bald eagle, northern harrier, double-crested cormorant, black-bellied plover, western snowy plover, semi-palmated plover, greater yellowlegs, sanderling, dunlin, ring-billed gull, western gull, glaucous-winged gull and rock pigeons. The sightings included all three of the expected plover species. The most gratifying of all the sightings was to see 13 western snowy plovers. They were up to their usual tricks. Sheltering themselves from the wind behind a small log, kelp, or other debris or running about, but stopping whenever a tasty morsel was discovered. Once a sheltered space was found the snowy plover who got there first began hogging the space and chased all who came near away. The welcome sign was not out for other snowies or any other shorebird, for that matter. These little puffballs were quite ferocious when it came to protecting their space. The western snowy plover nests on the Willapa National Wildlife Refuge at Leadbetter Point. Driving on the beach in their nesting area is prohibited during the breeding season in an effort to help protect them. The dates of closure for most beaches where the plover nests on the West Coast is March 15 to Sept. 15. The western snowy plover is pale in color and very small in size. It lays its eggs on the dry sand where it blends in well with its surroundings. 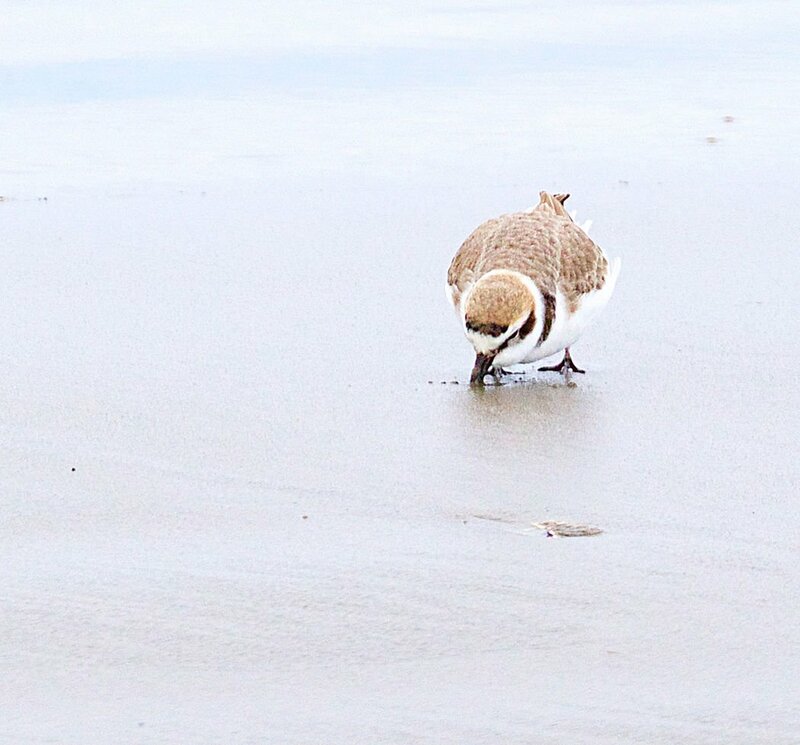 Thus, because these plovers are not easily seen, they can be run over or stepped on. Restoration of the habitat at Leadbetter Point is currently being undertaken in an effort to further protect this species. By extending the sandy beach habitat, more and safer nesting areas will be available. Five bald eagles were seen on the day of the count. One of them was particularly entertaining. It appeared to be dancing on the beach. This behavior drew our attention and prompted photo taking. The photos revealed that this adult eagle was wearing two leg bands, one on each leg, which were subsequently reported to the count recorder. The right leg sported a metallic green band, while the other leg sported a brassy-gold colored band. We hope to hear the details on our bird. The bands will tell the story of who, when, where and why. The Saturday we counted was perfect. The winds had subsided to gusts of about 10 miles per hour, the sun came out for a bit and so did the birds. It is amazing what one can see on the beach during the calm after a storm. ”Common Birds of the Long Beach Peninsula,” by Kalbach and Stauffer, is available from the Chinook Observer, Bay Avenue Gallery, Time Enough Books and the Long Beach Visitors Center.